I’ve worn several professional hats since my daughter’s birth 14 years ago. I owned a children’s’ clothing company during her toddler and early elementary years, which grew into writing for a blog which is now, Celebrity Moms & Babies on People.com. I parlayed my writing experience and product contacts into placement of children and baby goods in TV shows and films like The Hangover, Hangover 2, & Star Trek. And since 2009 when my daughter decided to pursue acting, I’ve focused my energies into Hollywood Mom Blog, a positive community and news outlet for the parents of professional child performers. On the surface it appears these careers are random and unrelated, but the truth is they all share one vital core – my passions. I didn’t go to a headhunter or answer an online “help wanted” ad for any of these jobs, I created each one out of a passion I had, and reinvented myself personally and professionally along the way. 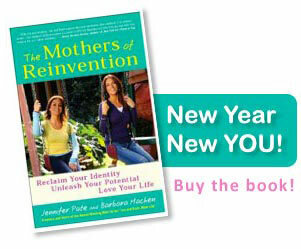 I’m not alone in the mom-job reinvention process. When I first met Ciaran, mother of four, she owned a children’s apparel line. Today she is one of our most influential social media experts. My girlfriend G.g., mother of four, went from designing baby and maternity wear to owning a high profile P.R. Company working with upscale brands and celebrity parents. Danielle, mother of two, sold the website she created for millions of dollars and reinvented herself as an advocate and media spokesperson on the benefits of breastfeeding and attachment parenting. But just when you think you’ve finally reached your career destination – the destination changes. And while I was still wrapping my head around those opportunities, I was asked to serve on the prestigious advisory committee of the Actors Fund alongside highly notable individuals like Fred Savage, Melissa Gilbert and Henry Winkler. Suddenly, I saw a much larger vision of the future and my ability to give back to this underserved community. There you have it…continually growing, evolving, reinventing. Whether in your personal or professional pursuits, giving yourself the freedom and permission to evolve and reinvent is how your best “self” will ultimately be revealed and your passions will grow into opportunities. California Girl Tracy Bobbitt is a wife, mom, step-mom and recent Glam-Ma who aspires to blog daily at Hollywood Mom Blog.